Stock Control – Bar codes and Real-Time Stock Management. A flooring specialist came to Ocom looking for a simple way to manage their stock control. They had looked at other stock management solutions but could not find anything that worked for them. There were a lot of Stock control systems but none of them worked for our client. Some were too complex, others not complex enough. They need something simple to operate in the warehouse without too much work to get real-time stock figures. Real-Time Stock control – All stock movements are recorded through the central database. As stock arrives in the warehouse it is given a barcode that uniquely identifies this stock item. As the stock is used they scan the barcode and update the quantity used. The system keeps track of the stock left in the warehouse. The sales staff can quickly see what stock they have and what is left. They can also see if they need to re-order new stock. Efficient Stock management is achieved using Barcodes. 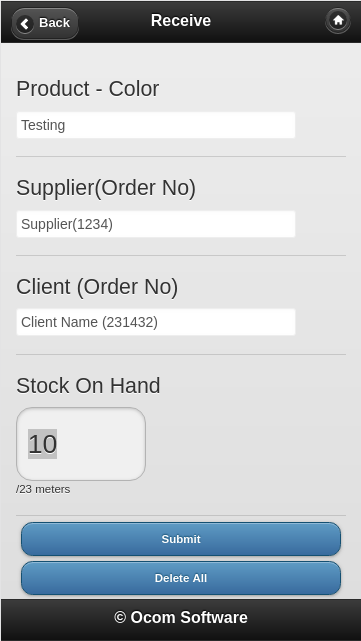 Each stock item has a unique barcode that is scanned in by the tablet app to retrieve the current stock that is on the roll and allow the Warehouseman to update the stock as it’s used up. Custom solution – our solution is built just for our customer and maintains the right balance of simplicity and accuracy they require.